If there is a term we Indian people are familiar with in the urban setting it is Relocation. Sometimes a move is a good thing. For some years that last place had been too crowded for the Indian communities needs. The parking situation is vastly improved, too. 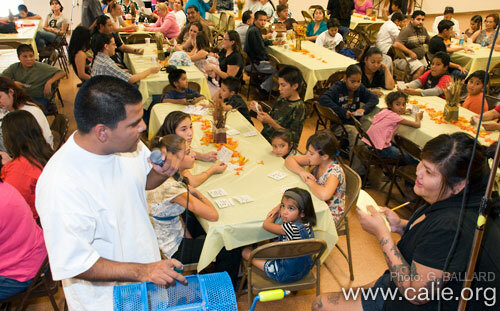 The Barrio Station Auditorium 2175 Newton Ave, 92113, with reservations, can accommodate a larger number of happy faces to our community events. 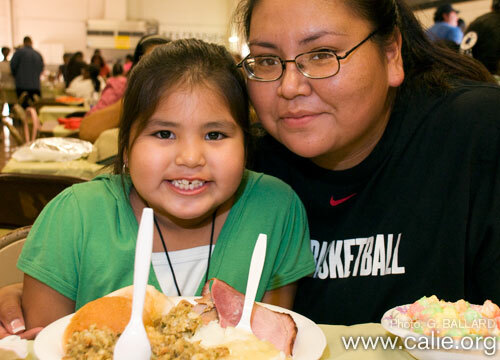 Vicki Gambala estimated over 500 people received traditional American Thanksgiving Day meals during the event. Vickie said the event has ran for some 15 years now and has become a popular holiday tradition for many local San Diego County community members in Indian country. We hear that 2008 is the year for change. What has not changed is the need to bring the Indian community together, in a safe setting. 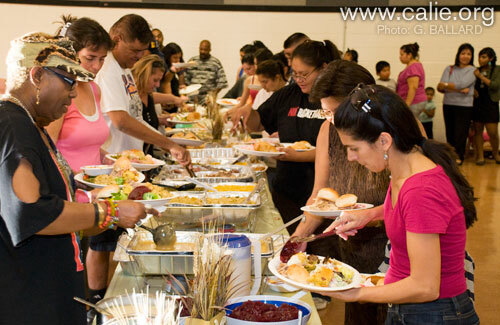 To provide an opportunity for them to enjoy the time together with family and friends. Indian food, songs by Spiritual Storm, games and gifts some might say it cannot get better than this. But a chance to hear our elders and smile at the Indian children having good fun in the Children’s corner will add to the warm glow that that turkey and dressing full feeling we bring away from the gathering. 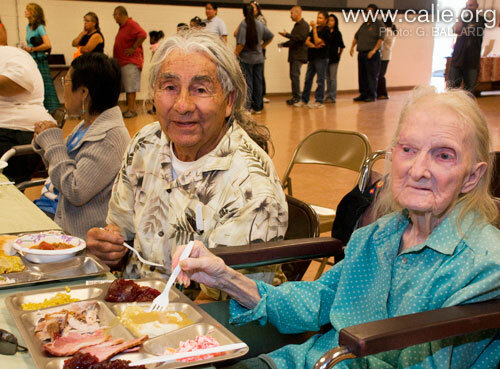 An elder Cherokee Indian couple come to the event every year for the good food and family atmosphere. The couple have 194 years of life between them. 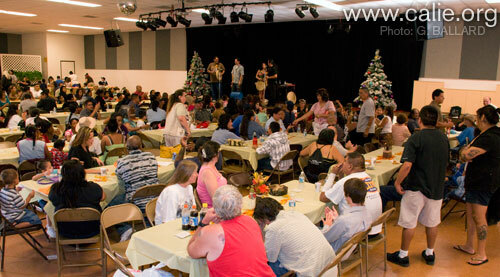 Many San Diego tribal TANF families enjoyed the holiday dinners and camaraderie with other urban tribal famlies. Each year many groups and organizations step up to make it happen. It still requires a driving force to see it through to the success that each year has produced. This year we need to recognize Juan Castellanos of the Indian Human Resource Center and his staff for their constant attention to detail and responsible diplomacy. 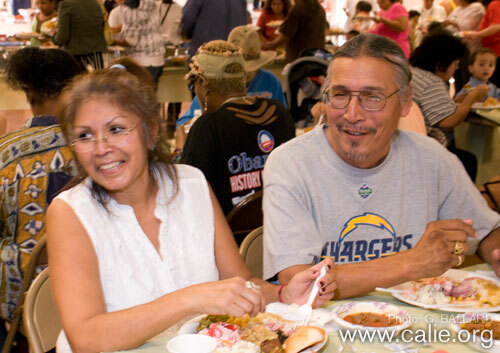 Additionally, we appreciate the financial support of: the Barona Band of Mission Indians, Rincon Luiseno Band of Indians, Southern California American Indian Resource Center-SCAIR, Tonkawa Seniors Council, Citizen Potawatomi Nation and the San Diego American Indian Warriors Association-AIWA. 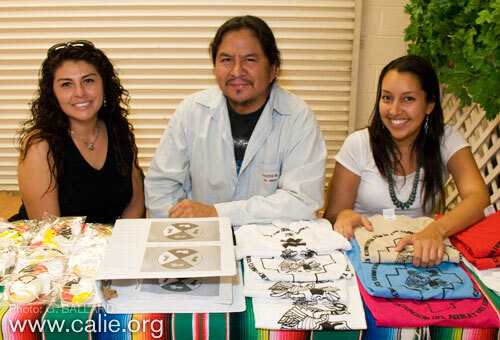 We hope to see you at the next Traditional; Winter Gathering Saturday December 13, 2008 from 2pm to 4pm. It will be at the same ‘new’ place Barrio Station. The Holiday gathering committee can always use more financial support, wrapped gifts, prizes for games and warm bodies to help setting up, serving and cleaning up. Volunteer, you will feel good about it! 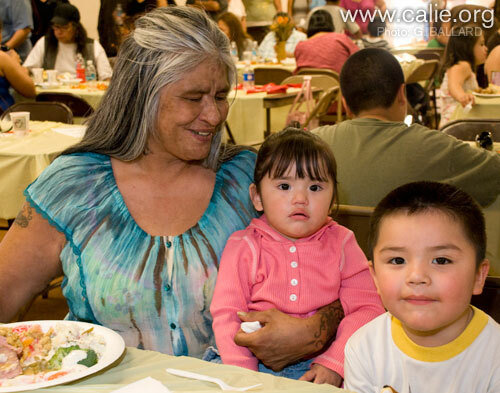 The San Diego Tribal TANF programs help support Native American families and actively work to instill a sense of belonging to a stable Indian community within urban Indians by providing drug- and alcohol-free family events and social services for Indian families. 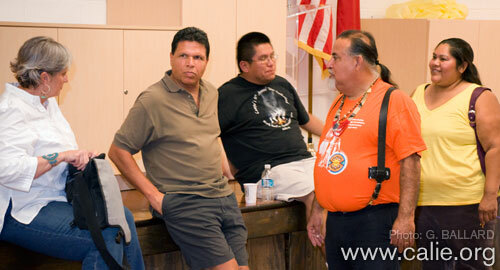 The event was sponsored by Southern California Tribal Chairmen's Association SCTCA Urban Tribal TANF Program. 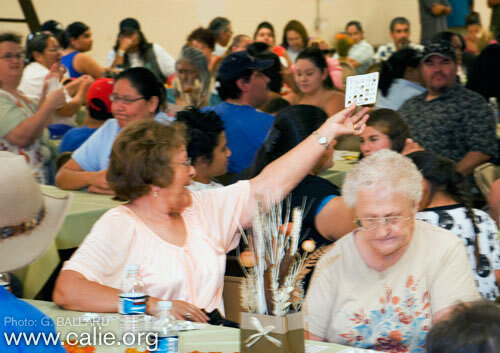 Bingo was played during the event. A happy winner calls BINGO on a winning card! 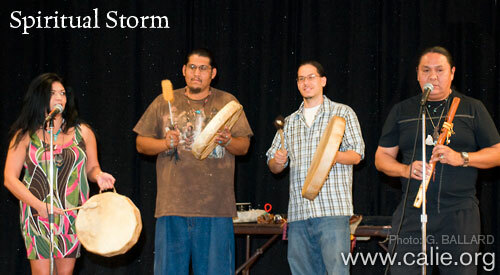 The Native American group Spiritual Storm provided traditional Indian songs, including singing, flute, drum, and gourd rattle. 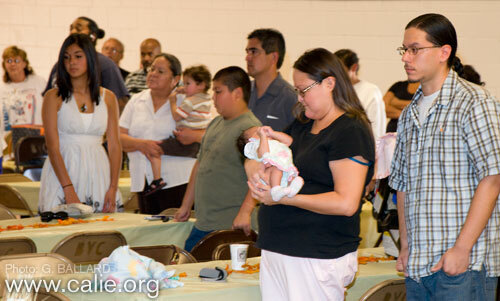 Sponsors provided meat for the feast, many families provided pot luck and there was plenty of food for everyone. 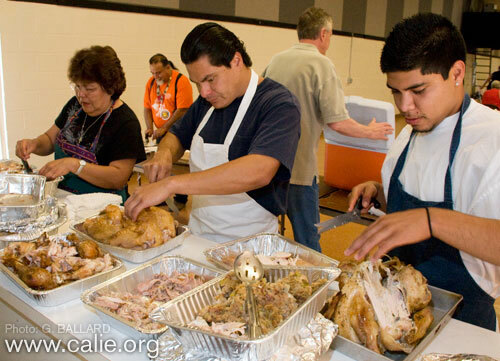 Here, volunteers are pictured preparing the feast. 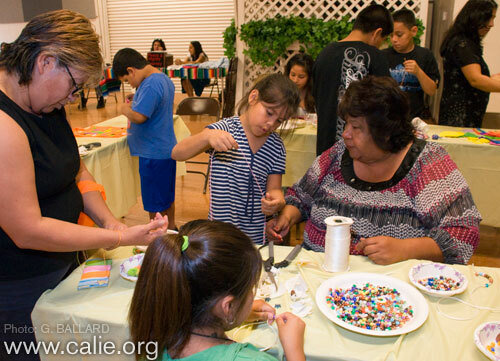 Vicki Gamballa hosted arts and crafts tables for the children. 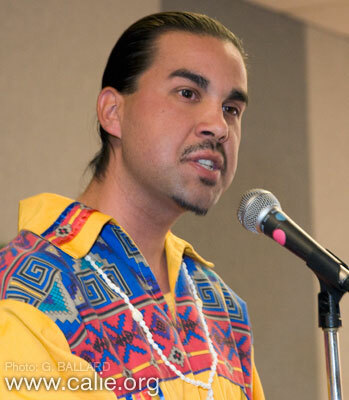 A young Native American athlete, Arturo Tisnado, spoke on behalf of the Peace and Dignity Journeys 2008 program. Arturo Tisnado is a P&DJ 2008 runner representing San Diego. He ran from Alaska to El Salvador, about six months with them. 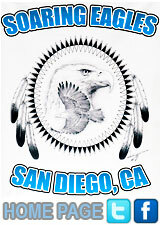 He wants to continue the awareness of the runners and the run, and to unite the San Diego Indian communities for the next one in 2012. 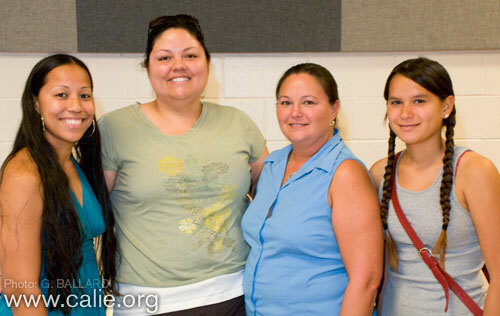 Jerry Kien, Diné, hosted a Peace and Dignity Journeys table with two of his young female collogues. Left is Sylvia Romo-Lara. Sylvia and her husband, Joe, are the San Diego area coordinators for P&DJ 2008. Right is Patty Mejorado. Patty also contributed a lot of time and effort and ran as well. 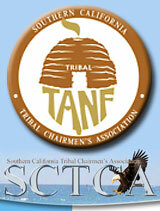 Southern California Tribal Chairmen's Association SCTCA San Diego Tribal TANF staff also hosted a booth. 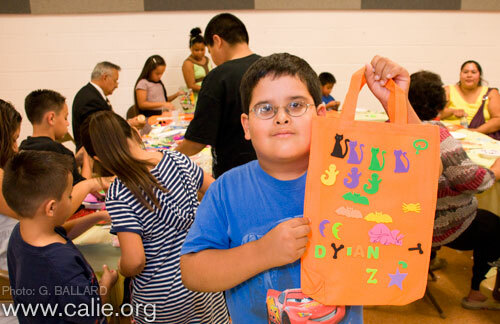 A young urban Indian boy takes a picture with one of the crafts he made during the event. Organizers mingled with the guests and kept their fingers on the heartbeat and health of the local San Diego County Indian community. Finally food was served, elders got head-of-the-line privileges. The large Barrio Station Auditorium with its large open area, open doors, provided an ideal "breezy" atmosphere for the large crowd and its many children to play and create craft projects, including a safe outdoor playground area for the more active children. A happy young Native California girl takes a picture with her mother.